"I want to play more mummy..."
For a child playing is a key tool to build up their relationships, education and culture. Playing helps children develop personal strength and self-confidence which contributes to their stability and independence. At encore ! we like to experiment and create toys which have the capability to involve and stimulate children. 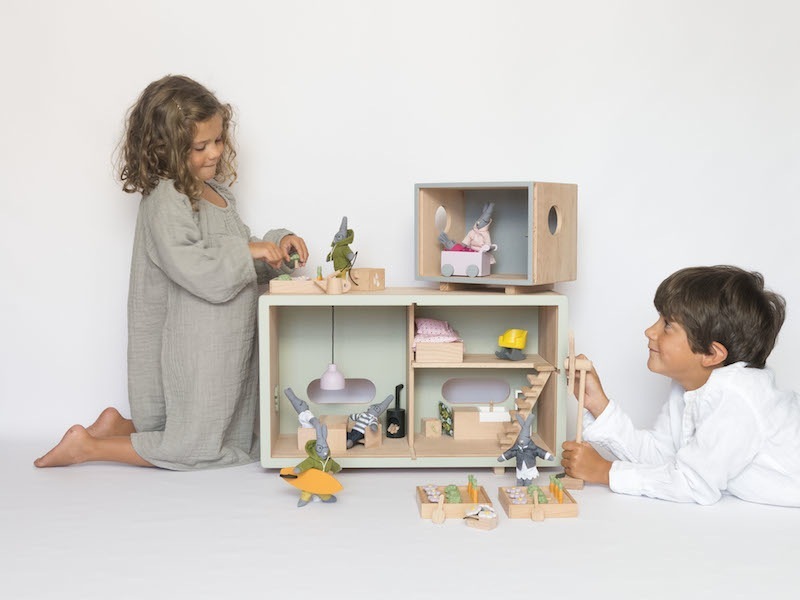 All our toys are designed to let children create their own worlds when they play and so will play... more and more ! The concept of green neighbourhood could be seen as an imitation game. Children imitate behaviours, making them a part of their way of thinking (thanks to the poster presented below and guidance from parents) and adapting them in their own personal way. Later on in life, they will spontaneously apply environmentally-friendly principles to everyday life: today we are bringing up the children who will be the future of tomorrow’s planet. Learning : why ? How does it work ? Answering children’s questions seems essential. 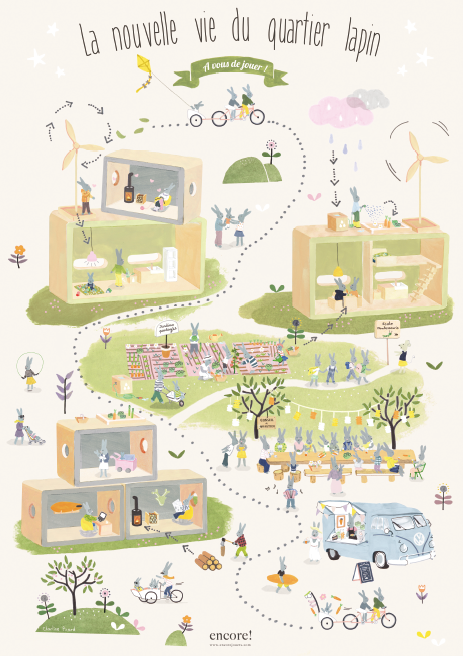 We have designed a picture which is linked to the houses and elements and explains how life in a green neighbourhood works. In order to meet both educational and aesthetic needs, we chose a picture showing the rabbit family in an environmentally-friendly area. For instance, items such as wind turbines, solar panels, rainwater collection containers and vegetable gardens can function as a basic introduction to environmental principles. This poster was also designed as a decorative item. Because of its pastel-shades, it fits in perfectly with the colours and design of a child’s bedroom. A tidy room is also a happy room ! Simply decorated and uncluttered spaces play a key role in the well-being of children. One of our main goals when designing toys is keeping spaces neat and tidy. For instance, during a play break or after playing, items can be neatly placed inside the house behind sliding doors. Maria Montessori argues that tidiness is an important element throughout childhood. One of our main target was keeping things simple so that children can learn to be neat autonomously.